Thailand is home to some of the friendliest, most gentle and generous people in the world. Thailand is a favorite destination for cruisers from Australia, New Zealand and those sailing to the Mediterranean. The island of Phuket is where most people head with it's great anchorages, food, people and yachting facilities. This is also a terrific place to have maintenance work done as the costs are low and the workmanship good. Long Passages had a complete refit done at Phuket Boat Lagoon. 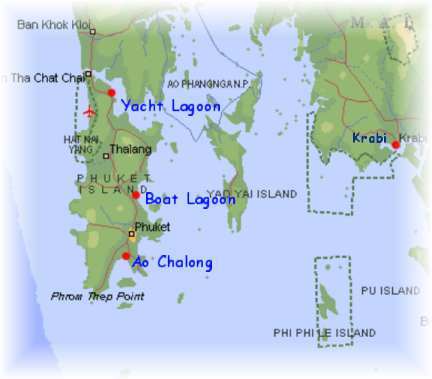 Check-In Ports - The following are some of the more popular ports in which to check in/out of Phuket. Hoist Courtesy flag when entering the waters of Thailand. Do NOT fly Quarantine flag. Phuket town immigration and customs. These are separate offices in the vicinity of each other. Take passports, boat papers, crew lists, entrance fee receipt to either the one-stop facilities at Al Chalong or to the individual offices in Phuket town. Visit immigration first to have passports stamped. The exit fee in 2003 was 510 baht.